Google is regularly listed as one of the top companies to work for in the world. It offers generous compensation packages, perks which include free meals and massages, and whimsical addons, such as slides in its offices. People are understandably eager to work there, and it receives thousands of job applications every day. 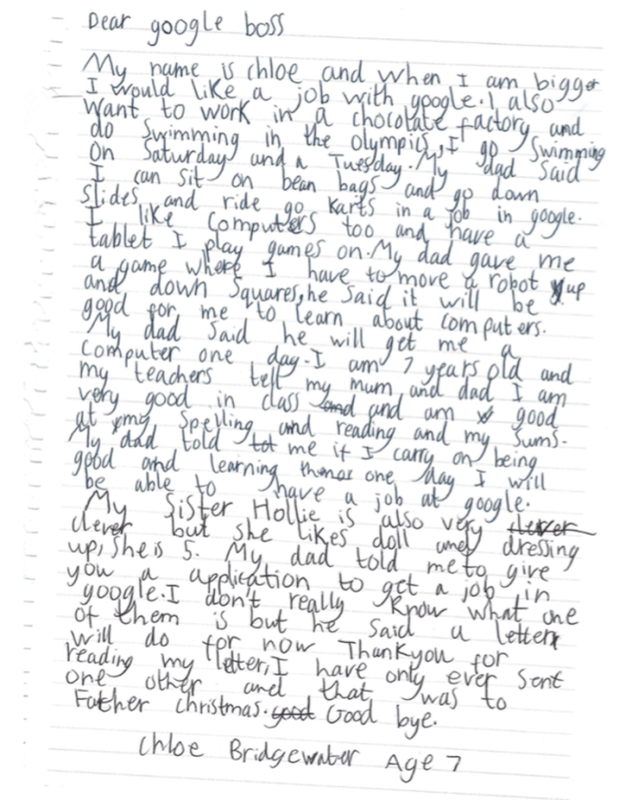 Among the people who wanted to work at Google was 7 year old Chloe Bridgewater. And she applied to none other than the CEO. Dear Google boss,” she wrote in a handwritten letter. “My name is Chloe and when I’m bigger I’d like a job with Google,” she began. Chloe made a strong pitch about her abilities, “I like computers too and have a tablet that I live to play games on.” – and included her educational qualifications, “My teachers tell my mum and dad I’m very good in class”. Her reasons for working with Google were pretty much what most candidates would say – “I can sit on bean bags and go down slides in a job at Google.” Chloe wasn’t being particularly picky with Google though – she said she’d also be ok with working in a chocolate factory, and become a swimmer at the Olympics. 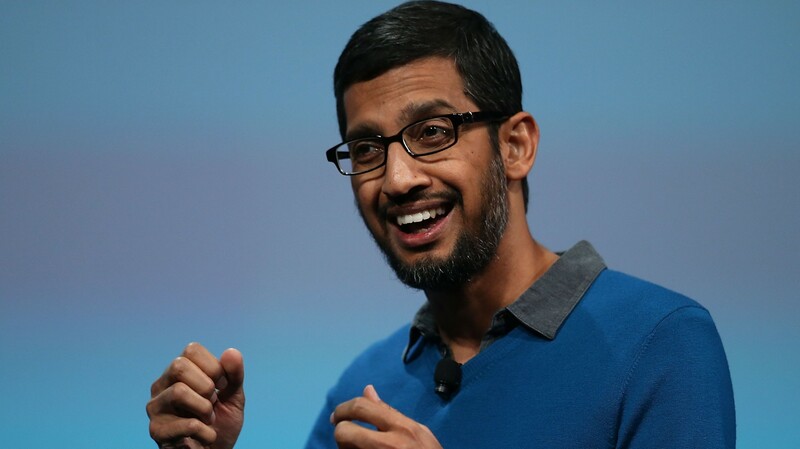 Now most job applications at Google don’t reach the CEO, but this one did. And incredibly, Sundar Pichai took time out to reply. So there you have it folks – if you want to work at Google, and find that your degrees and programming skills aren’t quite cutting it, you might you to go back in time and send a letter to the CEO. That should get a foot in the door. 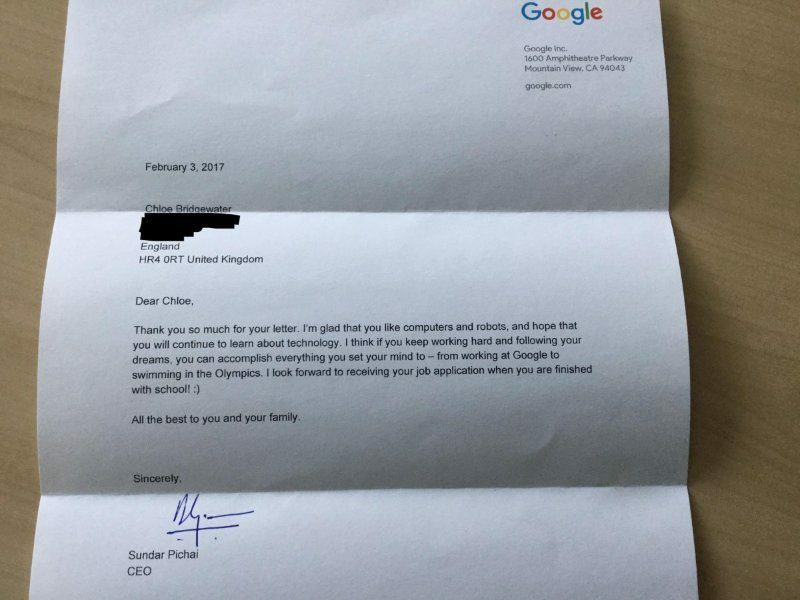 The post Google’s CEO reply to this 7 year old girl’s handwritten letter is winning the internet appeared first on TechJuice.